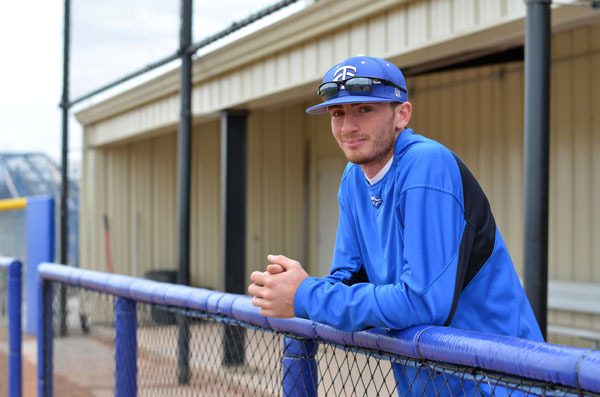 After coming to Tabor College to pitch, Jake Jones has found a new role on the baseball team this season. He’s started 24 games at second base for the Bluejays and is batting .437 in 32 games played. Two and a half years ago, Jake Jones came to Tabor College to pitch. During the first two years of his collegiate career at Eastern Oklahoma State, and even in his next two after coming to Tabor in 2014, Jones was a pitcher. These days, however, after four years of focusing on pitching, Jones can be found not on the pitchers’ mound, but in the field—he’s started 24 games at second base for the Bluejays, with stints in the outfield and at first as well. He began consistently batting second in the lineup at the start of KCAC play in early March. “(Coach Mark Standiford) told me last year that he was going to try me out in the field during the fall,” Jones said. “I did alright and so I earned a spot and it’s kind of gone from there. Of Bluejays who have played in 20 games or more, Jones has the second-highest batting average (.437) and the second-best on-base percentage (.518). In 32 games played, he has recorded 52 hits, including 14 doubles and eight home runs. He has driven in 31 runs and has a slugging percentage of .756. Jones, who grew up in Wichita, said he’s played baseball for as long as he can remember. What started as games of catch in the yard with his younger brother, Josh, transitioned to T-ball and continued from there. Jones played high school ball at Wichita Northwest, where he pitched and played in the field. His last two years of high school, Jones also played summer ball for Standiford at the Wichita Sluggers Academy. Jones’ high school career culminated in what he said became his favorite baseball memory from that time: Senior Day, and taking part in a tradition of parents throwing a pitch to their graduating seniors. After graduating from high school in 2012, Jones went to Eastern Oklahoma State to pitch. Jones said he enjoyed his two years there. Jones kept in contact with Standiford, he said, during that time. Jones decided to come to Tabor to pitch. Knowing he would need a fifth year of school to attain his physical education degree, Jones redshirted his first year in 2014-15. Jones returned to Tabor for a second season in 2015-16. He pitched in nine games that year, throwing 18 innings and recording a 2-0 record. Tabor was one win away from advancing to the World Series but suffered an NAIA Opening Round tournament championship loss to Science and Arts. Jones has returned for his final season in a different role. He said the hardest part about it has been the hitting itself, with Tabor’s pitching staff providing a test early on in practice. Jones said the transition back to hitting has renewed his joy. “I love going out there every day now,” he said. “It got to the point where it wasn’t as fun as it was. Being able to play every day, being a position player—because pitching, it doesn’t matter how good you are, you’re not going to play every game. That’s just what pitching is. Jones ranks nationally in 13 categories, including third in runs scored per game (1.47), fifth in runs scored (47), 10th in doubles (14) and 10th in hits (52). Jones said he loves everything about baseball, including its relevance to life. “One thing I always think about is how much it resembles life,” he said. “Every­body says it’s a game of failure. If you fail seven out of 10 times in your career, you’re going to the Hall of Fame. Passion for the sport has led him to pursue a career in coaching. Jones coaches at Sluggers during the summer; he had his first head coaching assignment there last summer for a 16-year-old team. Following his graduation this spring, Jones said he plans to serve as the graduate assistant for the Tabor baseball team. After that, he would like to coach at the collegiate level. But first, Jones and the rest of the Bluejays have a season to complete. Tabor is 26-7 so far this season, 9-3 in KCAC play. The Bluejays currently sit atop the conference, one game ahead of third-ranked Oklahoma Wesleyan. The Bluejays rank 10th in the NAIA Top 25 poll. The team’s ultimate goal is to get back to the NAIA World Series, Jones said, with a key part of that being winning the KCAC title. Jones is one of three current Bluejays who have experienced the 2015 World Series, and he’s seen first-hand the caliber of teams that qualify.